what are the non-surgical treatment options for sleep apnea? 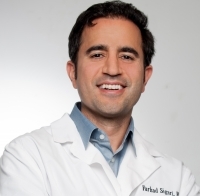 » Watch Next Video by Farhad Sigari, MD, FACS - How can someone tell if he or she has a sleep disorder? What are the non-surgical treatment options for sleep apnea? The initial treatment option for sleep apnea is the CPAP device, which is a machine that's connected to a mask. The patient wears this at night. This delivers air to the airway and prevents the collapse that leads to sleep apnea. For those that can't tolerate the CPAP therapy, there are some in office procedures that can help treat sleep apnea. One is the pillar procedure where three to five inserts are inserted into the pallet that stiffen the pallet and prevent that collapse. Another treatment option that can be done in the office is radiofrequency therapy at the base of the tongue and pallet. This causes scarring to occur in these areas and over time it can stiffen these areas and cause an improvement in the airway that can improve sleep apnea. And for those for that an in office therapy is not right for them, we can offer an oral appliance that they wear at night that prevents the airway collapse. And further, there is a newer therapy called EPAP that they can wear, if they are a candidate for it.